It’s hard out there for a fleet manager. They’re worried all the time, which gives them high blood pressure, shortness of breath, ulcers… just terrible, terrible health. The cause of all this stress? Increasing gas prices. Yes, gas. 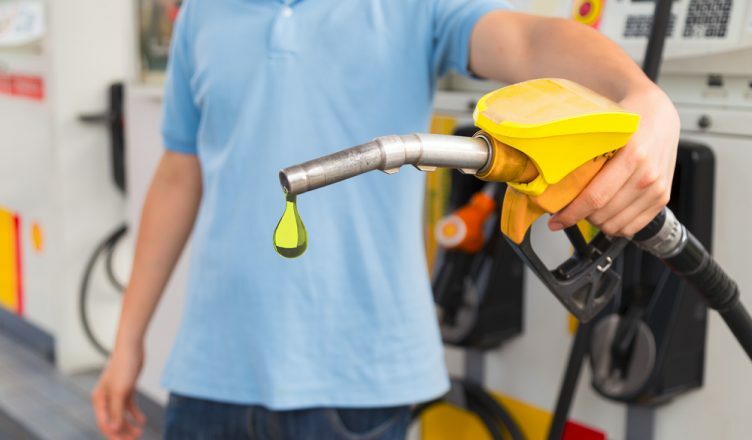 Rising gas prices have become an especially big problem over the last couple of years, making it difficult for managers to figure out how to handle their necessary expenses and still turn a profit. You can save your fleet managers from much of this stress by using a route planner to monitor fuel costs and implement methods to reduce such expenses. Not every driver is an 100% honest driver. Sometimes, your drivers are going to run a quick errand, pick up something to eat, or make some other personal stop on company time. When this happens, you’re paying for the gas they use to travel to a place that you never asked them to travel to. Also, these personal stops put your drivers off schedule, so to get to customers on time and stay out of trouble they’ll speed up and drive a little recklessly. Driving like that will waste a lot of gas (according to the American Trucking Association, a truck traveling at 75 mph consumes 27% more fuel than one driving at 65 mph). 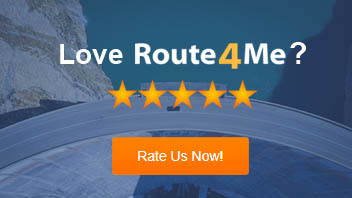 Route4Me comes with a GPS tracking feature to help you track driver activity on the road. When your drivers know they’re being watched, they won’t make personal stops and then rush to customers, which’ll save you a lot of money on gas. According to a Sustainable America report, the average American driver spends more than 16 minutes a day idling their vehicle. All this idling burns through 3.8 million gallons of gas every single day, resulting in a daily waste of $7,980,000. If a driver is waiting on a customer or stuck in traffic for what they expect will be more than 5 or 10 minutes or so, they should turn their engine off until they need it again. Also, you can use GPS tracking to cut down on idling. You’ll be able to see from your office if a vehicle is stopped for a long period of time. You can address the situation immediately and contract your driver, figure out what’s going, and help them get moving again as soon as possible. Our route optimization software will get your drivers where they need to go in the shortest time possible (while still abiding by all traffic laws, of course). Less time driving means you won’t have to pay as much for gas. Route4Me takes all the complicated moving parts involved with route planning, including traffic, construction, left turns, U-turns, and more, and gives you 100% optimized routes in 30 seconds or less. With our help, you’ll use less fuel than ever before. We all know that the heavier an object is, the more difficult it is to move. You’d rather move a stool from one end of a room to the other than a couch, right? The same logic applies to the transportation of goods. The heavier the vehicle is, the more fuel it takes to move. According to a study conducted by the Massachusetts Institute of Technology, vehicle weight reductions could reduce your fuel expenses by 12-20%. Balancing weight more evenly will also reduce your fuel expenses. Managing weight distribution across multiple vehicles is a dreary task to do my hand, though. It takes hours, and it’s easy to make a small mistake during this tedious process that ruins all your calculations and hard work. Let Route4Me take care of this task for you. All you have to do is plug in your vehicle weight and volume constrictions and your customer demands for a given route, and we’ll do the rest. Discussing fuel spending behavior with your drivers and showing them how they can help reduce fuel expenses should be a top priority. They can’t improve if they don’t know how to improve. That’s just common sense. Our last mile delivery optimization software comes with a reporting and analytics feature that gives you the data you need to see what you’re doing well and what you could be doing better. Route4Me allows you to set fuel costs for different types of gas in a specific area to help you track your expenses to an extremely accurate degree. 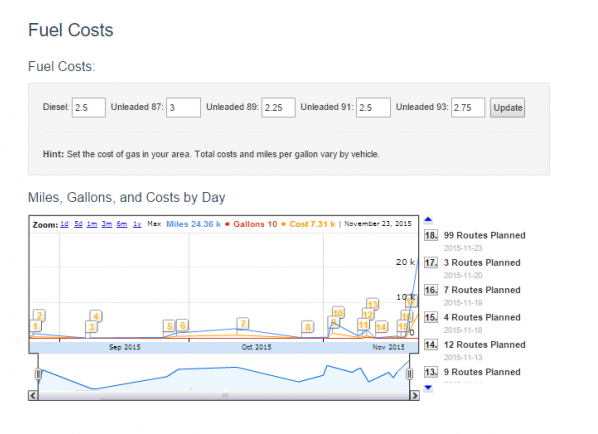 You can also use the timeline tool to view and analyze your fuel expenses for selected routes over a given period. Use this information to give your drivers feedback about their performance. You should consider offering your drivers some kind of reward for fuel-efficient driving, like a plaque in the office or a gift certificate to a nice restaurant, to give them a little extra incentive to save you money. Are there any methods you use to reduce fuel expenses that we left out here? Let us know in the comments section below.